Cute, creative, and affordable date ideas! Date night is essential to healthy relationships. However, dinner and a movie can get boring. Call the babysitter and mix up your date night! Check out these creative yet affordable ways to spend your evening together. A game is a great way to have some fun while sticking to a budget. From monopoly to trivial pursuit to truth or dare, there are sure to be a few games that you can play. You can play just the two of you or invite other couples over for a double date. Go for a walk, ride bikes, rent a kayak for the day. It doesn’t matter what outdoor activity you do, but spending time outdoors together gives you time to bond over a new shared experience. Plus, all beauty and wonder of nature makes for quite the romantic background. Plan a Picnic in the Park. Whether you prepare a basket or stop for take-out on the way, pick up some food, grab a blanket, and head on over to your local park. Enjoy the beautiful weather and a delicious meal together. Plus, there’s sure to be plenty of people watching! In the suburbs, there are lots of local events to choose from. From local coffee house concerts to small, unique museums and art galleries, explore all your town has to offer. You’ll have a great time while you support your community, and you may even learn something new. Pick a local charity that you both support and spend the day volunteering. Play with puppies or feed the homeless at your closest soup kitchen. You’ll be helping a great cause as you bond together. 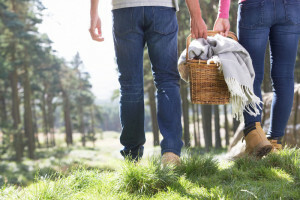 Have fun out and about with your sweetheart! Then, protect the ones you love with the right insurance. Contact the professionals at Robert J. Los Insurance Agency to find you the right policies. Located in Hamburg, New York, we serve all your personal and commercial insurance needs.